Breitling: thinks there is going to be a hard revaluation and it goes up from there. I think there is going to be a hard revaluation and it goes up from there. But what if there is a small float in-between? It doesn’t mean anything. …the last report I got, the dinar was at 4 billion notes. I don’t know what it’s at right now. They could have added a billion notes to the note count. I don’t know. But I know what needs to be done. I know what the management team for the dinar want to do. And I know they can do it. It’s that simple. I’m willing to take the risk. Re: Breitling: thinks there is going to be a hard revaluation and it goes up from there. Breitling loves to talk about note count, because the actual money supply doesn't work for his RV. Since there are no figures available on the note count (not that I know of anyway, because it's not really relevant) he can say pretty much whatever he wants to say with impunity. If I have a ten dollar bill and you have ten one dollar bills, we have the same money supply but your note count is ten times that of mine. If we exchange your note count will go down and mine will go up, but our money supply remains $10. Reducing the note count has ZERO to do with reducing the money supply liability at the CBI. 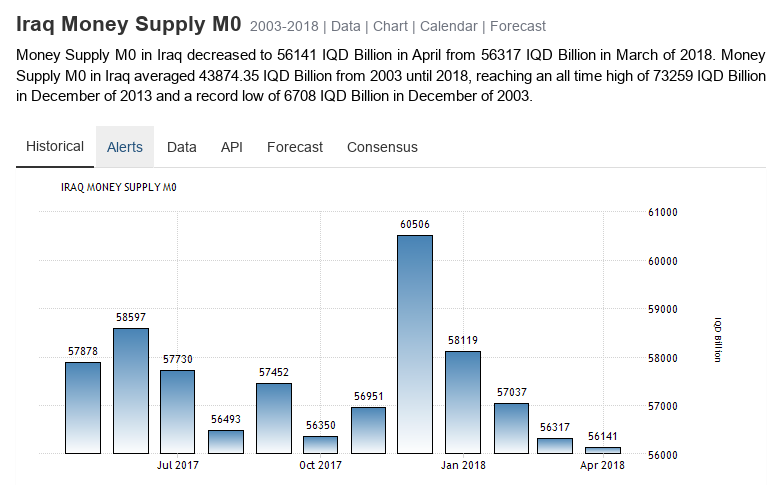 As long as there are tens of trillions of dinar nobody is going to make any money off of the IQD. By the way, nice graphic Nash. It seems they are bringing the money supply down a bit. That way they won't have to keep dropping the value. Obviously they want exchange rate stability.